On April 20, 2010, British Petroleum (BP) reported an explosion on its Deepwater Horizon rig located in the east-central Gulf of Mexico resulting in a discharge of crude oil into the Gulf that would ultimately affect the waters of the state of Alabama. The potential effects of the oil release on the environment included degradation of water quality, oiled fisheries, shellfish and wildlife, damaged coastal areas such as marsh and beaches, health effects on humans, and numerous socio-economic impacts that may not be determined for months and years to come. It was determined by local, state and federal authorities providing oversight of the disaster that the restoration of the Isle Aux Herbes cut in Portersville Bay would be beneficial to protecting the recently restored sensitive areas designated as shellfish nurseries and/or harvesting in the vicinity of the island. Therefore, funds were made available through a BP emergency grant to the state of Alabama and ultimately to the city of Bayou La Batre to close the cut, thus reducing the chances of oil contamination in these sensitive areas. Isle Aux Herbes (also known as Coffee Island) is an uninhabited island located approximately 1.5 miles southeast of the mouth of Bayou La Batre in Portersville Bay. 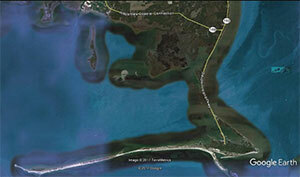 The island has virtually no topographic relief and is comprised of a variety of marsh grasses and other aquatic macrophytes typically found on barrier islands in the region. Sediments in the vicinity of the cut and around the island range from silty sand to fine sand with an average near-shore depth of three to four feet. Due to past tropical storms and hurricanes, Isle Aux Herbes developed a breach (cut) roughly at its midpoint resulting in two separate islands, Isle Aux Herbes (north) and Terrapin Island (south). McFadden Engineering, Inc. was retained by the city’s consulting engineer, Polysurveying, Inc., to design a natural closure structure (i.e. 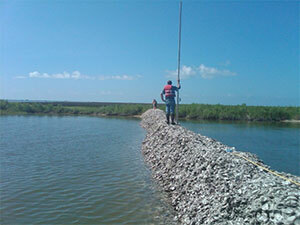 oyster shells) eliminating the hydraulic pathway through the island cut. Under an emergency work order, the city retained J&W Marine to construct the structure using natural materials as expeditiously as possible in order to minimize oil contamination should it occur. The permit application to perform the project was submitted on May 18, 2010 and the work was authorized by U. S. Army Corp s of Engineers via an emergency permit on May 19, 2010. The construction of the berm structure connecting the south end of Isle Aux Herbes to the north end of Terrapin Island, effectively closing the hydraulic pathway in the east – west direction, aided in protecting the nearby newly restored shellfish habitat. In addition, the closure of the cut allowed ongoing research projects that were being conducted by the Alabama Department of Conservation and Natural Resources and the Nature Conservancy on the east side of the island to continue and provide a natural barrier for the projects giving them a greater chance of survival.